We offer conventional turning, milling, (both CNC and conventional), predominantly for prototypes, repairs, 1 off's and small batch work. 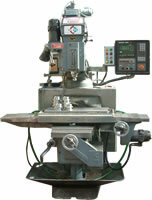 CNC Milling: We offer CNC milling with a traverse of x 500mm, y 500mm & z500mm and a table area of 500mm x 350mm. Our Powermill Kondia K-76 is equipped with Anilam Crusader series GXM controls and is both operator programmable as well as accepting remote programs. Conventional Milling: We offer conventional milling for components up to 1000mm in length. With 3 universal milling machines equipped with DRO’s and a host of equipment we can offer both horizontal and vertical milling and boring. Conventional Turning: We operate seven conventional lathes. 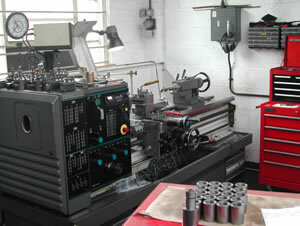 All machines are fully equipped, and we have the capacity to machine up to 2500mm in length and diameters up to 560mm. Broaching: We offer in-house broaching facilities. Please contact us with any requirements you have. Assembly: Small component assembly including bearing and seal fitting. Hydraulic Presses: We operate two hydraulic presses for straightening purposes as well component dismantling and subsequent re-assembly. The maximum force we can exert is 50 tons. Skilled Staff: Our highly skilled staff have years of experience in the operation of these machines, and as a company we never turn work away due to its intricacy or complexity. We thrive on the work larger companies might turn away.